If Drivers Won’t Pay to Bypass Congestion, Why Should Taxpayers? A pilot project to bring high occupancy/toll lanes to State Route 167 in metro Seattle has grossly deviated from projections, raising questions about the value of added road capacity. The 10 miles of priced lanes — the only “HOT” lanes in the Pacific Northwest — were converted from HOV lanes in 2008 and cost $18 million to implement. Five years later, Seattle-based sustainability think tank Sightline Institute reports that usage and toll revenue on the lanes are far lower than anticipated. 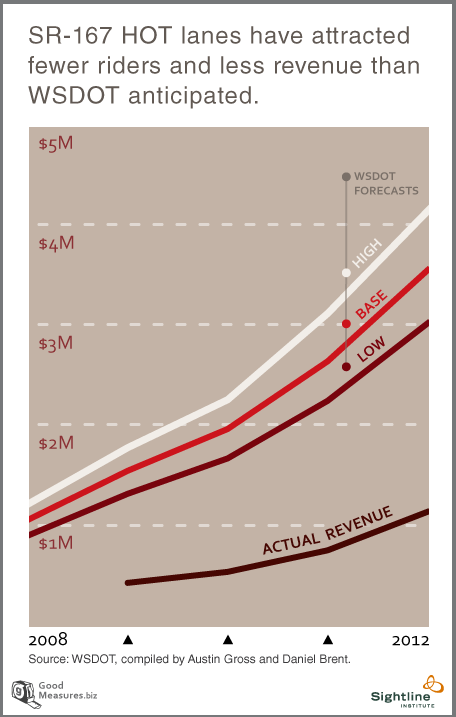 Last year, the lanes collected about one-third the revenue of the most conservative predictions from the Washington Department of Transportation. The state had planned to expand “hot” lanes around the state, but the experience with SR 167 could change that, the News Tribune reports. Two factors seem to be at play: People are driving less, and they aren’t as willing to pay their way out of congestion as was assumed. Sightline’s Zachary Howard and Clark Williams-Derry report that in 2006, planners predicted that traffic on 167 would rise 2.5 percent a year. Instead, it fell three out of the following five years, including a 5 percent dip in 2008. According to WSDOT figures for 2011, northbound drivers during peak morning hours paid an average toll of $1.75 to enter the HOT lane, saving about nine minutes in the process. Southbound evening peak-hour travelers paid $1.25 for about six minutes of time savings. Given those values, peak hour HOT lane toll payers apparently are willing to spend about $12 for every hour they save in traffic. The prevailing theory about HOT pricing is that people would be willing to pay half their hourly wage rate to avoid sitting in traffic. But based on income data from WSDOT, far more commuters earn more than $24 per hour than are opting for the priced lanes, reports Sightline. Gas tax should be upped to about $8 or $9 per gallon to cover all the negative externalities of driving. Do traffic engineers still believe they can predict the future? Do more drivers take the HOT lanes when traffic is worse than expected? Some drivers may be paying for increased reliability rather than increased speed. Not nearly to the extent that politicians and urban planners do. re, “added road capacity” (in first sentence). Not quite – the added capacity, if I understand correctly, is NOT in the form of new asphalt but in the form of additional management, as in what tolling advocates refer to as “managed lanes”. [The HOT lanes “were converted from HOV lanes in 2008”]. HOV lanes were the new asphalt when they were added well prior to 2008 (don’t know when – my guess is the 1970’s, the era of concrete). Rarely do we see HOVs converted from mixed-use lanes. In fact, in Calif., Caltrans has a policy to NOT do conversions – they’ve had that since an infamous case in Pasadena when the transpo’ director under Gov. Jerry Brown – first term – carried-out such a conversion and the public, rather, the driving public, went bongos. Better to pay (regardless of source) for adding management to provide additional capacity than widening roadway. what about trucking – or would you have the prices of every commercial good that moves in this country dramatically inflate? I’m guessing the 495 HOT lanes in Fairfax County are going to end up much the same. Granted, I don’t use 495 during rush hour, but the times I do use it, the HOT lanes are empty and the toll charges are barely over $1. I don’t see how they expect to meet revenue expectations if the lanes are only getting used for a couple hours a day during the rush hours. This is an important point, but I don’t think it changes the final verdict. If the money from the gas tax is rebated to the general public, then people will have extra money to spend to buy whatever goods have gone up in price. The average person will spend as much extra on goods and gasoline as they get back in the rebate, while people who travel and buy less will make money, and people who travel and buy more will lose out. But this way, people will have an extra incentive to buy local goods that don’t require as much gasoline to ship around, rather than goods that have to be shipped across the ocean and then trucked all the way across the country. huh? what’s the point of collecting in the first place then? Ryan Brady said that the point of the tax was to cover the negative externalities. That suggests that what we’re doing is making people pay the true cost of driving, and then giving that money to the victims. Since the externalities of driving are basically generalized environmental damage and generalized risk of collision, the simplest way to give money to the victims is to divide the money equally among all people. The point of this sort of program is so that when people have a choice between two options, they’ll take the full social cost of the options into account. When they have a choice between apples from Wisconsin or apples from Chile, they might cost the same right now, but the gas tax will make the ones from Chile more expensive. Similarly, if an HDTV manufacturer wants to build a new plant, under current law they might prefer to open a plant in China where labor is cheap, but once they have to pay for the full cost of shipping (instead of foisting half the cost of pollution and collisions onto innocent bystanders), they might find that it’s cheaper to open the plant in Milwaukee. The extent to which I see “2020, 2035, 2045, etc… projections” tend to be much more the product of traffic engineering than urban planning. Not to mention the estimation of these volumes and corresponding operations to the level of one car or second of delay – so I disagree with your statement. Why do you think transportation would be only cost factor? Can you get Wisconsin apples year-round? Is the labor cost of picking them the same as it is in Chile? Engineers are asked to build facilities that don’t become immediately obsolete. We have to make some kind of estimate of how many cars, how much water supply, how many train riders, etc. In the past, traffic projections were often too low. Now, due to demographic changes, the cost of gas, and people’s preferences, they are often too high. Engineers will change their methods to account for that. Predictions for transit ridership have often been too low. We’ll fix that too to try to avoid building transit systems that hit capacity too soon. On the other hand, go read the long term planning documents that come out of SCAG or ABAG. They look 30 years into the future, and claim to know how many housing units each city needs, how many jobs it should accommodate, and how much greenhouse gas each housing unit and job will emit. They know how far people are willing to walk to transit or retail. They know how many kids people will have. They know that Parcel A is a good site for mixed-used development but Parcel B a half-mile away is not. They know that Redwood City’s downtown should be 6x as dense as it is today because it is a priority development area, but the Sunset District is not. In short, it seems to me that a lot of planning is based on the idea that somebody knows or can predict what an entire region’s cityscape, economy, and demographics will or should be. The scale of predictions engineers are trying to make isn’t anywhere close to that. much water supply, how many train riders, etc”, which of course is also true of planning. Your distinction is misplaced (still) in my opinion, since both areas of study deal with this issue. I didn’t ask why these predictions were off, as you so eloquently pointed out, simply that engineers make just as many predictions about the future as planners. I don’t claim that transportation is the only cost factor. But the problem is that right now it’s a cost factor that isn’t fully taken into account. If you ignore transportation, then of course labor cost is always going to dominate. But once you start taking both into account, you’ll find that sometimes one wins and sometimes the other does. It depends on how much labor and how much transportation (and how much of all other costs) really is involved in whatever good it is that we’re talking about. If there are positive externalities that don’t outweigh the negative externalities, then the charge should cover the difference between the two. If there is an activity that really has larger positive externalities than negative ones, then the government should pay people to do those things, and collect the money out of income taxes. I’m an engineer, so I’ll freely admit that I don’t know as much about planning and I’m probably biased. But I don’t see the purpose in doing things like trying to predict how far people will walk to transit, and then defining a TOD zone within that radius of a station. Obviously, the probability someone will walk decreases as distance increases, but it depends on so many factors – quality of walking/cycling facilities, the person’s preferences, cost of driving and parking, etc. Maybe there’s a cheap piece of land 1 mile from the station, and people who’d be happy to walk a little farther to the station in order to get cheaper rent. A high gas tax wouldn’t affect delivery prices in the long term. Goods which currently travel by truck long distances would end up traveling by rail (and this would likely be electrified rail if diesel fuel was taxed at a high rate). Trucks would mainly be needed for local deliveries from the rail yard to the final destination. Here electric trucks would work fine, actually better than diesel trucks given the short distances involved. Yes, we need trucking, but mainly for “last mile” delivery. It would actually be a great thing if most long distance trucking simply disappeared. We would save a ton of money on highway repairs for starters. And far fewer people would be killed by trucks driven for long hours by fatigued drivers. you think the railroads are going to keep their prices static…lol! Railroads have to compete with each other, don’t they? Even if long distance trucking disappears, there will be more than one option to ship long distance. In fact, besides having to compete with each other, railroads will also have to compete with container ships. The point of the gas tax is to price in those negative externalities so that people’s behavior will more accurately reflect the societal cost. Makes it a bit more complicated, but I don’t see why transportation should necessarily have to pay the gas tax – especially if it can be shown that there are benefits that outweigh the drawbacks. Not really…ever looked at a map of the Class 1’s? So Your City Is Adding HOT Lanes. Will They Work for Transit? Maryland should heed the warning.